Los Angeles, CA February 24, 2007: The Pakistani American Leadership Center (PAL-C), organized its second “Community Outreach” event in the city of Los Angeles on February 23, 2007. The well-organized event was held at the LAX Hilton with about 130 people from the business and political community in attendance. The purpose of the event was to emphasize the importance of political participation, community activism, and the role of Pakistani Americans in today’s America. The “Community Outreach” series was launched in December of 2006 with the inaugural event held in Houston, Texas. The aim of the series is to strengthen PAL-C's ties to the nation-wide community in USA, forge relationships with other organizations and to formally invite Pakistani American leaders to join PAL-C's ranks. The exclusive event was organized by Mr. Pervaiz Lodhie, Founding Director of PAL-C. PAL-C was also represented at the event by two other Founding Directors - Dr. Rafiq Rahman and Mr. Mossadaq Chughtai and the most recent addition to the Board of National Directors - Dr. Maqsood Chaudhry. 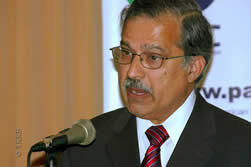 Mr. Arif Mansuri, a well-known figure in the Los Angeles community – was introduced as the latest Regional Director of PAL-C. The PAL-C function started with a reception that allowed community members to mingle with each other and with Congresswoman Linda Sanchez and Ambassador Mahmud Ali Durrani. Also in attendance were aides of Congressman Gary Miller and Congresswoman Hilda Solis. PAL-C had also invited members of the Council of Pakistan American Affairs, Friends of Pakistan, Council of Pakistan American Chamber of Commerce, Urdu Writers’ Society, FBI’s Multicultural Advisory Committee, Los Angeles County Sheriff’s Pakistan Advisory Council, and the Council of American-Islamic Relations. Mr. Pervaiz Lodhie formally inaugurated the event and introduced the Master of Ceremonies for the evening PAL-C Executive Director Mr. Ali Chaudhry who had flown into town from Washington, D.C. Mr. Chaudhry thanked the audience for its participation in this important effort to unite the community and introduced the PAL-C Directors. Mr. Chaudhry welcomed the speakers for the evening and praised Congresswoman Linda Sanchez’s efforts to work with the Pakistani community and her commitment to the Congressional Pakistan Caucus. Mr. Mossadaq Chughtai, PAL-C National Director, made a comprehensive presentation on the “Past, Present and Future” of PAL-C. Mr. Chughtai pointed out that there was no national presence of Pakistani Americans in Washington, D.C. and this is why PAL-C was formed in 2004 – to galvanize the community across the county and to represent our common interests in the nation’s capital. Mr. Chughtai highlighted PAL-C’s recent efforts to educate lawmakers about Pakistan as well as its campaign to mobilize the community to oppose anti-Pakistan legislation. Finally, he listed PAL-C’s future vision and urged the community to support its efforts financially, intellectually and morally. Mr. Ahmed Ali, Director of the Council of Pakistan American Affairs (COPAA), introduced Los Angeles County Sheriff Leroy D. Baca to the audience. Sheriff Baca gave a passionate and heart-rending speech in which he described his love for Pakistan, highlighted his recent trips to the beautiful country, and praised the commitment of the Pakistani American community. 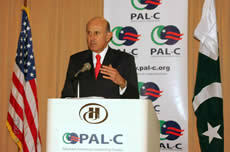 Sheriff Baca also complimented PAL-C’s efforts and urged the Los Angeles community to support PAL-C. The next speaker was Mr. Hussam Ayloush, Executive Director of the LA Chapter of the Council of American-Islamic Relations. Mr. Ayloush described the many injustices minorities in this country have suffered, from the Irish to the Japanese to the Muslims, and stressed the importance of community activism and unity to overcome such challenges. He also described PAL-C’s efforts in working with Members of Congress to impact legislation that was beneficial for Pakistan. He urged the audience to become members of PAL-C. Lastly, Mr. Ayloush resolved to work with PAL-C and the Pakistani American community to safeguard their common interests. 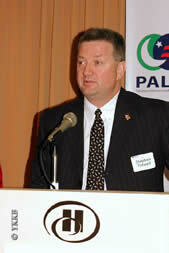 Next, Assistant Director of the Federal Bureau of Investigation (FBI) Mr. Stepehen J. Tidwell took over the podium. Mr .Tidwell described the work his agency is doing with the LA community and pointed out the members of the Multi-Cultural Advisory Committee (MCAC). Mr. Tidwell was appreciative of his introduction to PAL-C vowed to work with the PAL-C leadership. He also asked the community to encourage the Pakistani American youth to work for the FB to keep the country safe and secure. Professor Stanley Wolpert from the University of California at Berkeley, author of “Jinnah of Pakistan”, took the stage after Mr. Ayloush. He briefly praised the speeches of Mr. Tidwell and Sheriff Baca. Prof. Wolpert described his love for the community and his respect for the work PAL-C is doing. After dinner, the keynote speakers took to the stage. First, Congresswoman Linda Sanchez of the 39th District of California delivered a powerful speech in which she spoke of her experience as a member of a minority community that is similar to those of Pakistani Americans. She spoke of the importance of the US-Pakistan relationship and the visible activism in the community. She also urged the community youth to apply for internships with Members of Congress and to vote in every election from the city council up. Finally, the Congresswoman spoke of her participation in the Pakistan Caucus and promised to continue serving the Pakistani people. Los Angeles Consul General Mr. Syed Ibne Abbas praised PAL-C and said that it was very commendable that PAL-C is making strides to unite the community and to work with others to promote the Pakistani cause. 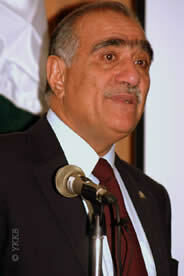 He introduced the Ambassador of Pakistan to the USA, Mr. Mahmud Ali Durrani to the stage. His Excellency credited PAL-C for mobilizing the community on the East Coast and said that PAL-C was doing very important work. He then advised the community to work together and be active in communicating their concerns to the U.S. Congress. He also described Pakistan’s efforts to battle militants along the Pak-Afghan border, to counter regional terrorists, and to promote economic reforms at home. Ambassador Durrani also credited the American efforts to help the Pakistani people in their time of need, after the earthquake of 2005. Finally, PAL-C leadership took to the stage again to deliver closing remarks. Dr. Maqsood Chaudhry of Virginia spoke of his personal experiences as a student in USA and said that PAL-C was unique in the sense that it has no hierarchy among its members and is inclusive of all Pakistani Americans. Dr. Rafiq Rehman of Kentucky spoke of Pakistan’s importance as an ally to the United States and insisted that this relationship deserves to be strengthened. 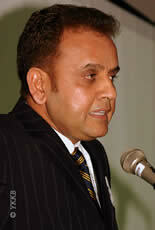 Mr. Arif Mansuri said he was very excited to join PAL-C as a Regional Director and thanked the community for its support. Mr. Pervaiz Lodhie listed the numerous challenges that exist for the community and said that only by working together can we overcome these challenges. 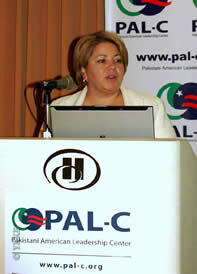 The Pakistani American Leadership Center (PAL-C) is the only professional Pakistani-American advocacy organization that is located on Capitol Hill. It launched the Congressional Pakistan Caucus in May 2004 and works to raise awareness about Pakistani-American interests in Washington policy circles. Our activities include facilitating the Congresiional Pakistan Caucus, liaisoning Pakistani officials and the community with Members of Congress and mobilizing all Pakistani-Americans at the grassroots level. If you wish to learn more about PAL-C, please visit our website www.pal-c.org or email us at info@pal-c.org.